It is difficult to remove the tape after the work is finished, so I hope you can easily remove it. This review is about item#6904396. Unlike paper masking tapes, you can paint tailoredly. Various sizes are available and the curves do not become wrinkle, usability is very good, it is necessary for masking work. This review is about item#6904405. I used it because I wanted to curl a circle about 20 cm in diameter during painting work. I pasted a beautiful circle with tape. I am very satisfied. This review is about item#6904414. Of course, it fits well on curves, but it is very necessarily a necessity for painting as it is very sharp when painting. This review is about item#06904405. I used it as a school's blackboard tape. I felt stickiness was a very easy-to-use product without any problem. I always use it for curves, so I use it with confidence. This review is about item#6904387. There is stretch and masking of curves can be beautiful. It is easy to use because it is hard to peel off because it is also stronger in stickiness. 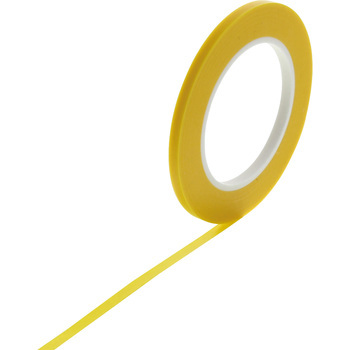 Even in comparison with the original product of Monotaro, this one is thin and easy to stretch, so it is easy to use. Used to draw a line to the car body. I will use it from now. Also evaluate after use. nice to meet you. I use it when sticking gold leaf. Organic lines are easy to draw and they are very helpful.